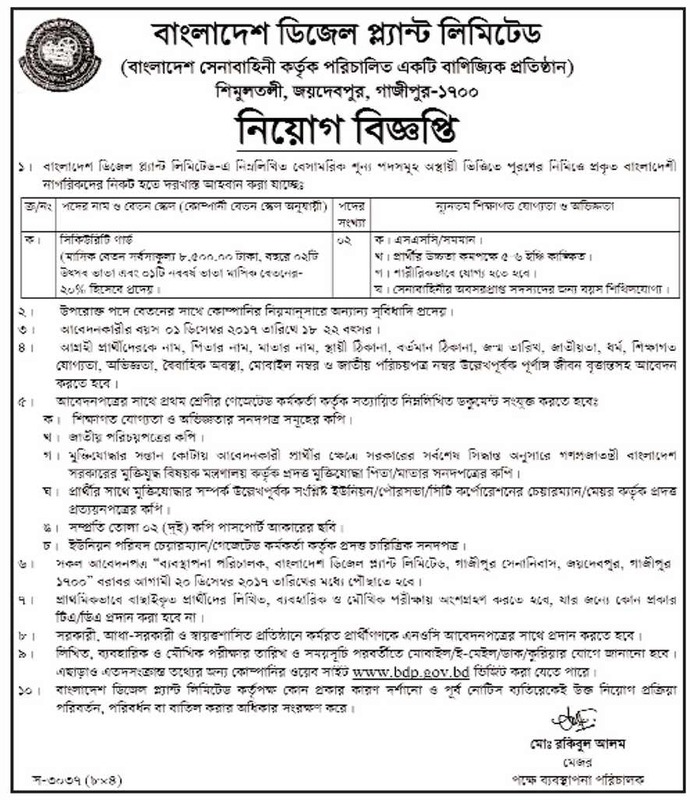 Bangladesh Diesel Plant Limited BDP Job Circular 2019 has recently published from the website at www.bdp.gov.bd Bangladesh Diesel Plant Limited authority. The application of the the Bangladesh Diesel Plant Limited will take up to 15th February 2019. Details of the job exam and more notice will be found our website and the official website of http://bdp.gov.bd. The circular of the Bangladesh Diesel Plant Limited BDP Job Circular 2019 has announced for 5 categories recruitment circular of Jan 2019. The application last date 15th Feb 2019. Here you will get all the notice of the circular and can apply from here. Applicants need to apply writing application letter have to pay for the exam fee via SMS system within the deadline 15th February 2019. Otherwise it will be not applicable. Details all information of applying process has given to the circular. Download the circular from below and go for a review and to apply. After successfully applying the task they need to attend in the examination. And they have to select by the exam result. The conditions and details will be available into the circular. Educational Qualification: At least JSC Passed applicants can apply for the posts with and Maximum Honours passed applicants can apply for all positions. Applications Deadline: Application will be continued 15th February 2019. Age: Minimum 18 to 40 years old from June. Salary: 8,250 – 53,060 BDT. Application Fee: based on post. To get regular such government job circular stay with our page and share our post to your timeline. You can also comment on our Facebook page at www.facebook.com/Bdresultpage or message to our Facebook page directly to contact us and to get more information about this Bangladesh Diesel Plant Limited BDP Job Circular 2019 then visit our website regularly at www.bdresultpage.com. Thanks for being with us.